I was in Nashville, TN a couple of weeks ago and made sure to check out the local music as much as possible. Trust me, there is a lot of music happening in this town! I flew into the city and landed at 9:30pm. I took a taxi straight to Broadway Street and met up with some friends at Rippys. It was one of the hottest days of the year and we were sitting in this open air restaurant melting, even at 10pm! The food was OK but the entertainment was great. We were sitting right by the small stage and decided to shoot images of the band that was playing, because...hey...that is what we do right? This is an image of Anna LaPrad, who was singing that evening. She is a really pretty girl with a great voice. I purchased her CD from her and it is very good. Her guitar player taking the lead while Anna took a break. You can get more information on Anna LaPrad here. Check it out. We got lucky and happened to be in town for one of the better line ups. There were a total of 10 bands playing on that Tuesday night, with The Charlie Daniels Band as the headliner. Here is a shot of Karen Fairchild, performing with the band "Little Big Town". Jimi Westbrook, also from the band Little Big Town, doin' his stuff. The next performer was long time artist (so they tell me) George Hamilton IV. It is really strange that in between each act, there is an announcer who is pitching products. "This part of the show is sponsored by Cracker Barrel...blah blah blah." Next up was the band "Gloriana". This is a shot of Rachel Reinert belting out a tune. And another member of Gloriana performing. Here is a shot of Craig Morgan working the crowd. You can see the crowd of people up at the front of the stage, mainly taking pictures with their cell phones. Here is Little Jimmy Dickens who, at the ripe old age of 91, happens to be the oldest living member of the Grand Ole Opry. He performed a couple of songs and told some darned funny jokes along the way. And then it was time for the headliner, The Charlie Daniels Band. I made sure to get to the front of the stage as soon as he came out. And Charlie Daniels did not disappoint. At 75 years old, he still has it. He played for at least 30 minutes and still can work that fiddle like nobody else. He finished his set with "The Devil Went Down to Georgia", which was awesome! This is a picture of him performing that number. Overall it was a great night. Even though I am not the biggest country western fan, it was fun to be at the famed Grand Ole Opry and to see some really great musicians. Being able to photograph them up close was a real bonus! Yesterday was the final day of the Women's U.S. Open of Water Polo 2011 and I was there to capture the Bronze medal match and the Gold/Silver medal match for USA Water Polo. The tournament was held in Lafayette, CA on a beautiful sunny afternoon (but not too hot). I got to the venue about an hour before the bronze medal match to meet my contact from USA Water Polo and to check out the pool, the light and get the lay of the land. I shot half of the preceding game, to check camera settings and prepare for the medal rounds. When shooting water polo matches, you need to be ready at any given moment, since the action is almost nonstop. And like any good photography, focus is key. I made sure to focus on both the offensive players and defensive players depending on what was happening in front of me. In the above image, you will notice that I focused on the eyes of the goalie to draw you into her concentration. Most of the images that I captured during the day were tight shots using the Canon 100-400mm L Series lens mounted on a Canon 1d Mark IV. But, there were times when I would pull back and show a wider view of the action. In this case, it worked out perfectly with the shooter, defender and goalie actively involved in the play while the others watch on. Having a camera that can burst at 10 frames per second really helps for shooting a fast sport like this. 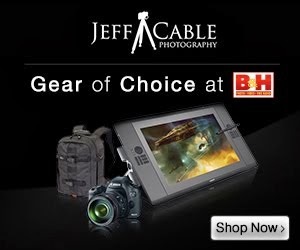 This allows me to frame the shot and burst images at the peak of action, freezing the action at that perfect moment. These girls are amazingly powerful athletes, often lifting half of their bodies out of the water to take that blazing shot at the cage. This was one of my favorite shots of the day, highlighting the goal keeper, Emily Feher, who was also the MVP of the tournament. It captures her at the height of the action as she lunges to her left to stop this shot by the Santa Barbara team. The Bronze medal team from Stanford. The Silver medal team from Santa Barbara. The Gold medal team from New York (NYAC). 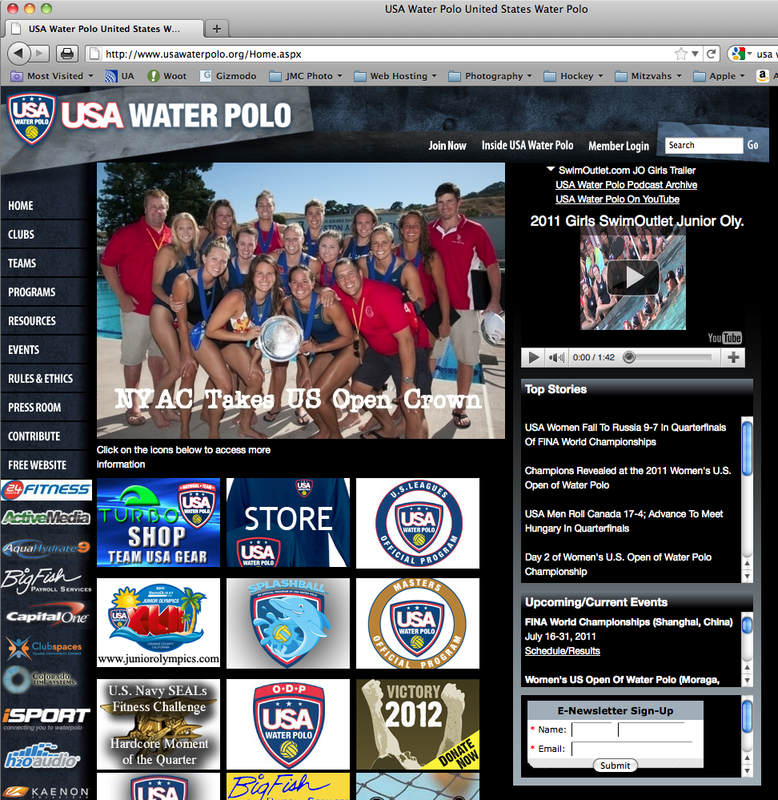 And...today's home page of the USA Water Polo web site features my shot of the Gold medal team. It was towards the end of our trip and I wanted to get a nice shot of a sunset from Agate Beach. As I was walking down the trail to get to the beach, I saw that the sun was setting in a perfect position for me to shoot through this foliage. I set up the tripod and shot 4 exposures of the sunset, and then merged them into one HDR image using Photomatix Pro. This shot was at the tail end of sunset on the fourth of July, as we prepared to shoot off (legal) fireworks on the beach with the kids. I set the camera so that I would have a nice long exposure, yielding some motion in the waves. 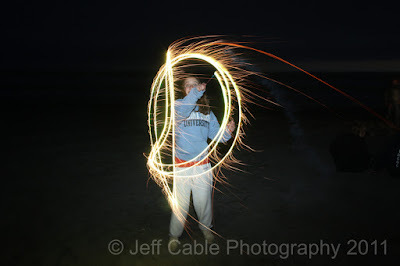 Speaking of long exposures, once it got dark, the kids pleaded with me to slow the shutter and capture fun images of them with their sparklers. I had taken these types of images of them years ago, and they remembered that, and wanted more. Who am I to refuse my kids and their friends? This is a picture of my daughter's best friend Danielle, who joined us for the week of camping. I asked her to move the sparkler to form the first letter of her name. I talked about framing in some of my other blog posts. I could have taken the picture above with just the moon in the frame, but chose to move my tripod so that I would have the tree to the left and the moon to the right. It makes the image much more interesting and gives it a sense of place. Finally, both the sun and moon had left for the night and it was time for me to capture a star-trail shot. I looked for a location where I could see a lot of the sky, but also frame the image with some of the large trees which surrounded us. I then set my camera on my Gitzo tripod, aimed the camera straight up (using my 24-105mm lens), put it in bulb mode and locked the remote for a 10 minute exposure. It turned out that 10 minutes was not enough, so I tried a 20 minute exposure. Still not good enough. So...at 11pm, I decided to lock the shutter for an hour and see what happened. Actually, I was concerned that the Canon battery would not last that long, but there was plenty of power for this long exposure. So 62 minutes later, after sitting there and marveling at the clarity of the night sky, I closed the shutter and looked at the final image on the LCD of the camera. Pleased with the results, I slipped into my sleeping bag a happy camper (pun intended). Patrick's Point State Park is now known for the abundance of wildlife, but they have their fair share of critters in the area. In the many times that we have visited the park in the past, we have never seen rabbits in the park. Well...this time we saw hundreds of them. You know what they say, if you see 2 rabbits, there are probably a lot more nearby. This little guy was nice enough to pose for me right by some yellow flowers. Very nice indeed. This black crow was a frequent visitor to our camp site and he really liked this particular moss covered perch. Speaking of frequent visitors to our campsite, there were 3 or 4 of these guys that would visit every afternoon at approximately 3pm.My sister-in-law was trying to identify them, so I shot some pictures to help her figure out the correct species. This little guy came down out of the trees and landed on one of our camping chairs, in perfect range for my Canon 100-400 lens. Just 20 miles North of Patrick's Point, you can find the largest herd of Roosevelt Elk in North America. I have photographed them before, but never seen them in the water, until this trip. We were getting ready to take a hike into Fern Canyon and I saw this big buck from the parking lot. I could not resist the temptation to photograph this big guy, so I asked my very patient family to wait for 15 minutes while I hiked into a better position and shot this photo. Then...after our Fern Canyon hike, we returned back to the parking lot area and I made my way out to photograph a couple more of the Roosevelt Elk who were still grazing in the area. All of these wildlife images were taken with my Canon 5D Mark II and 100-400 L Series lens, using Lexar 600x Professional CF cards of course! This macro shot captures the bumble bee with his tongue deep into the flower. It also looks like he is looking right into the lens of the camera. I found this little guy hanging out on a leaf and was captivated by the iridescent colors showing on his wings. As with any good photography, composition is very important. I saw this sprout which extended above the others and was perfectly framed by some green ferns in the background. I used the macro lens and set the aperture to blur the ferns while keeping the forground plant in perfect focus. As I walked slowly along the hiking trail, I came across a banana slug on a tree trunk. I looked at it and determined that it was not photo worthy. But, then I looked up and saw this tiny little mushroom growing out of the trunk. Even though this mushroom was probably no more than one inch wide, the macro lens helps to get us up close to show the details that we might not ever see otherwise. I saw these beautiful yellow flowers and thought that they might make a nice picture, but it needed a little more. Then I came across this fly who was hanging out, obviously waiting for a portrait session, so I obliged. The large red eyes and the colors in the wings really worked well against the bright yellow pedals of the flower.